I recently went to a work Christmas party and needed a quick and easy, but pretty hairstyle for my relaxed hair. I didn't want to whip out the steam rollers and didn't have time to put them in. I also didn't want to put any direct heat on my relaxed hair and wanted to protect my ends. So I opted for a very simple up-do that would keep my ends protected but also look chic and sophisticated. I ended up doing the headband tuck. How are you styling your hair for the holidays? Hi Leah, love the hair style. I have tried this several time with no success, love yours tho! Maybe one day I will get it! I had to try it a few times before I got it myself. 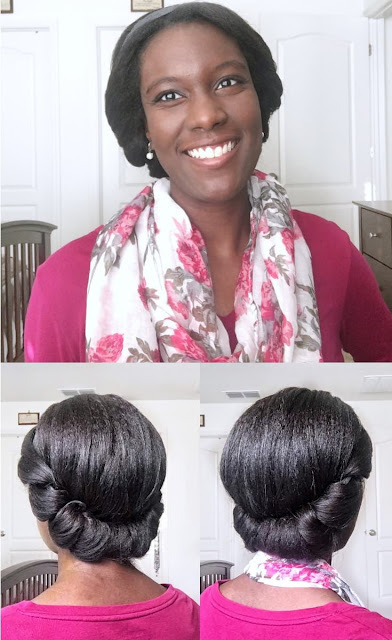 I found it was easier for me to start in the front on one side of head, stop once I got to the back leaving some hair out, do the other side, then take the back portion left out and do a roll/tuck and put in a few bobby pins to hold the back in place. 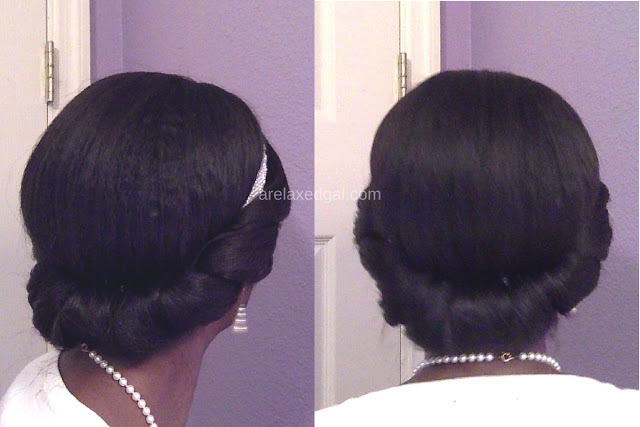 A cute style while protecting your ends.....love it!